The Pear Tree @ Greenland Place is a local neighbourhood restaurant with a deli serving high quality food to the families, residents and visitors of Surrey Quays, Canada Water, Rotherhithe, Bermondsey, Deptford, Greenwich, Blackheath, Canary Wharf and beyond! We are an Australian inspired restaurant and deli serving breakfast, brunch, lunch, dinners, and cake! We also have a Grab n Go deli – all in a relaxed and friendly atmosphere. Pop in to grab your morning coffee (from one of London’s best artisan coffee roasters), tea, freshly made juice and smoothies, with some freshly baked pastries or made to order breakfast baps from 7.30am on weekdays. If you are less rushed, have a sit down breakfast that starts from 8am. Breakfast lasts till 5pm. Our lunch menu starts from 11am with a wide range of sandwiches or hot lunches. For tradition, we have Fish and Chips Fridays and Sunday Roasts that starts from lunchtime. Dinner menu starts from 5pm, with last orders at 10pm. Our extensive menu range from a towering burger to a leisurely 3 course meal. Weekends and bank holidays brunch starts at 8am and lasts till 5pm. There is something on the menu for everyone – a healthy house made granola, a classic full English breakfast or something eclectic. Come in to find out! 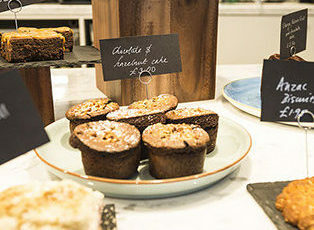 For the peckish, our range of home made cakes will hit your sweet spot. 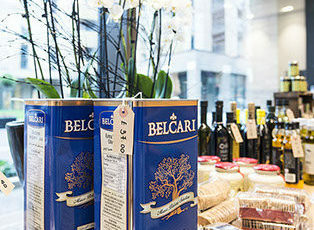 Take something home with you from our deli of largely local independent sourced produce. We strongly believe in supporting local independent suppliers. 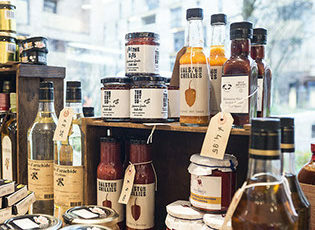 Our shelves are stacked with award winning chutneys, jams, oil, vinegars, spices, condiments, grains and pulses. Pick up what you need from our careful selection and more! You can treat a loved one to dinner at The Pear Tree at Greenland Place with one of our gift vouchers. Vouchers are available from £15 upwards and will be sent out first class to the recipient. 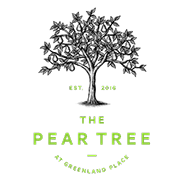 The Pear Tree at Greenland Place’s gift voucher may be used for breakfast, brunch, lunch, dinner, cakes and drinks. Please note that no cash or change can be given if the bill total is less than the value of the gift voucher. The gift vouchers are valid for one year from the date of issue. Hard copies of the gift voucher must be presented at the restaurant at the time of placing the order. Photocopies and emails are not accepted.